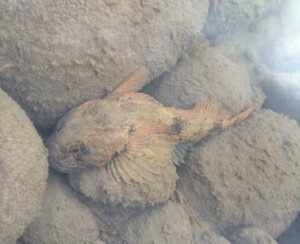 The sculpin is called “Kayeey” in Ts’msyen and is also known as bullhead or scorpionfish. The Supernatural Sculpin is one of my secondary family crests called Dzewalaks. The Supernatural Sculpin was used on totems, house-fronts and robes of power. The Pole of Sculpin was used as a house entrance with the large mouth as a doorway. One very old totem in Gitxaala features Kayeey – the Being of the Sea – represented as a giant person with small heads under each arm.